Platinum Gents Brushed Finish and Diamond Cut Wedding Ring — Form Bespoke Jewellers Ltd.
A great example of using texture to create a unique wedding ring. The customer came to Form Bespoke Jewellers and, with the help of our expert jewellers, decided on a brushed finish and diamond cut wedding ring. The flat profile of the platinum band has been softened by rounding the edges slightly. The customer then chose to have a brushed section running around the centre of the band, framed by diamond cut lines. This is a great way to create a more distinctive visual separation of the outer polished sections from the centre textured area. 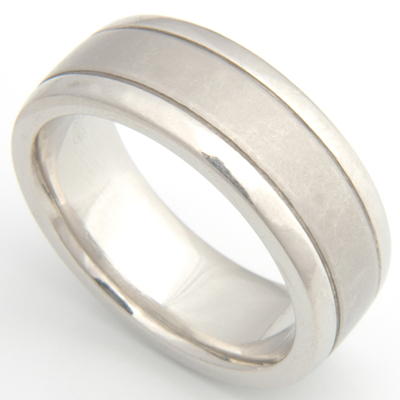 An effective contemporary gents wedding ring which is growing in popularity.